The Sudraker ll and lll are quite possibly the most reliable and sturdy oil skimmers on the market today and the only ones to offer a 5 year warranty on belts. Corrosion free, with an ergonomic design and easy to clean layout, the Sudraker oil skimming units are the logical choice for manufacturing environments needing to keep their down time to a minimum. The units also boast the well proven 'Tank track skimming belt' which is fatigue free, self lubricating and resistant to attack from a wide range of chemicals. The units are designed to run 24Hrs per day, so will keep working even when your equipment is not. The Sudraker ll oil skimmer will remove up to 2 litres of oil per hour* and the Sudraker lll oil skimmer will remove up to 3.5 litres of oil per hour*. Sudraker Oil Skimmers lift and remove unwanted floating tramp oils from metalworking coolants, parts washing machines, pressure spray operations, oil leakage pits, waste-water, and water treatment tanks. Tramp oil contamination of coolant and processing solutions has a serious detrimental effect on both of the solution and processing. Whilst most fluids will reject tramp oil, it is still possible that large amounts can be carried as suspension. This extraneous oil provides food for bacteria, inhibits the measurement of true concentration and ultimately will lead to product failure, giving rise to increased production and disposal costs. The Sudraker range of Tramp Oil Skimmers are a cost effective, efficient and adaptable solution for the removal tramp oils, by tramp oil skimming, coolant life can be increased, disposal volumes reduced proportional to the quantity of oil removed and overall coolant performance enhanced. 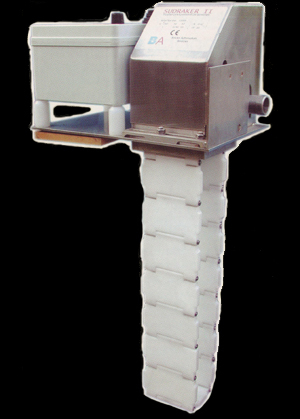 The Sudraker range of Belt Oil Skimmers are designed to meet the growing demand for oil skimming solutions in hostile environments such as effluent treatment tanks and other applications with high temperatures and often acidic and chemically rich atmospheres where other types of belt oil skimmer are not able to operate effectively. Both the Sudraker II and III Belt Oil Skimmers are a practical and complete oil removal operation. Floating oils and grease are removed and are gravity-transferred into a collection tank, the recovered oily wastes are held in this collection tank for convenient, clean, safe and efficient handling. Designed for virtually maintenance-free operation and very user friendly, the Sudraker range of Oil Skimmers are the most efficient and cost-effective way to continually remove and store floating oils and grease, and will deliver consistent and reliable results. Sudrakerfloating oil skimmers are quite possibly the sturdiest and most reliablefloating oil skimmers on the market. The Sudrakerfloating oil skimmer is quite possibly the sturdiest and most reliablefloating oil skimmer on the market. Sudrakerbelt oil skimmers are quite possibly the sturdiest and most reliablebelt oil skimmers on the market. The Sudrakerbelt oil skimmer is quite possibly the sturdiest and most reliablebelt oil skimmer on the market. Sudraker belt oil skimmers are quite possibly the sturdiest and most reliable belt oil skimmers on the market. The Sudraker belt oil skimmer is quite possibly the sturdiest and most reliable belt oil skimmer on the market. Sudraker tramp oil skimmers are quite possibly the sturdiest and most reliable tramp oil skimmers on the market. The Sudraker tramp oil skimmer is quite possibly the sturdiest and most reliable tramp oil skimmer on the market.